shine brite zamorano: let them eat, er, draw cake. let them eat, er, draw cake. Jeez. How many of my projects are of food items??? 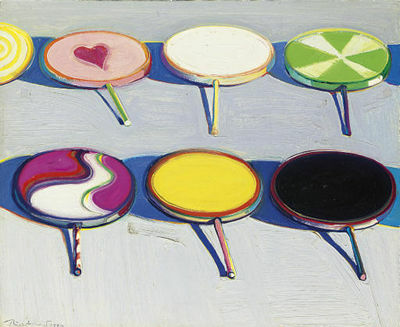 I have always loved Wayne Thiebaud's work. The sweetness of his palette and his subjects. The students looked at a few of his paintings and we talked about his use of geometric shapes and light/dark colors to make his desserts look 3d. I explained that a cake may look like a circle if you look at it straight down, but if you look at it on a table the top looks like an oval. Students combined ovals and straight lines to make cylinders that were then turned into cakes. When the cakes were "decorated", the students pressed softly to make tints and hard to make shadows. They also added black to emphasize the darkness of some shadows and cast shadows. 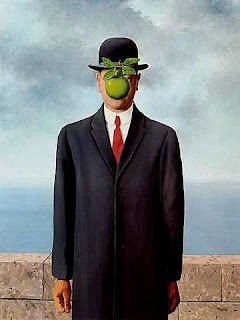 The work of Surrealist painter Rene Magritte is the inspiration for the other project. I call it, "You Are What You Eat". We look at some of Rene's paintings and how he made things that were not possible look possible. He does this with a careful eye for shape and color value so that his scenes look real and 3d. While looking at a couple more of Rene's paintings, we identify his use of scale, detail, and overlapping to create depth in his work. Students will use these same strategies to create 3d space in their versions of this portrait painting. Students choose one of their favorite things to eat or drink to replace the head in their portraits. They learned about complementary colors in a previous lesson, so I thought it would be a good, unobtrusive tie in to incorporate their usage in the background. 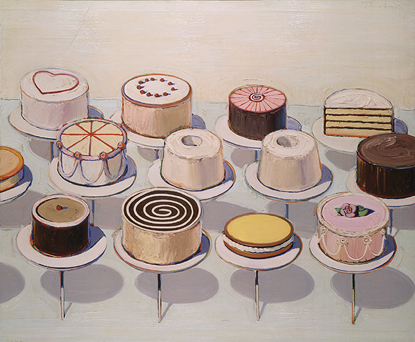 I love the combination of Magritte and Thiebaud! I've always thought that Thiebaud's work had a surrealist quality to it.